For this project we delivered ImageIndex+ to National Museums Liverpool. 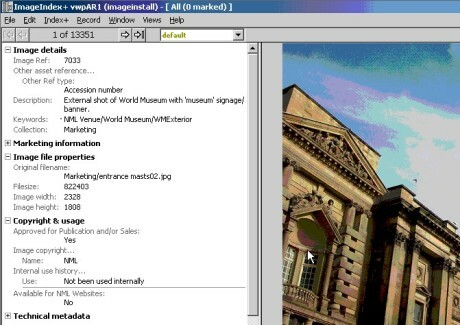 It provides a common image management system and repository for the eight constituent museums of NML. Object catalogue data is imported into the system from MIMSY XG. Application views and security are content-based. This means that the content you put into a record controls how that record is presented and who has access to it. In this case, the crucial content is which collection the record is catalogued as belonging to. This enables staff who work on the relevant collection to have greater access than others. MIMSY XG integration is done by putting the accession number into the image record and then running overnight harvests of MIMSY XG catalogue data to fill the image record with object information. The image ingestion process is configured so that the collection and the accession number can be put onto the image record automatically when the image is ingested.